Deconstructing the “Tunic Under the Stairs” at the Met. 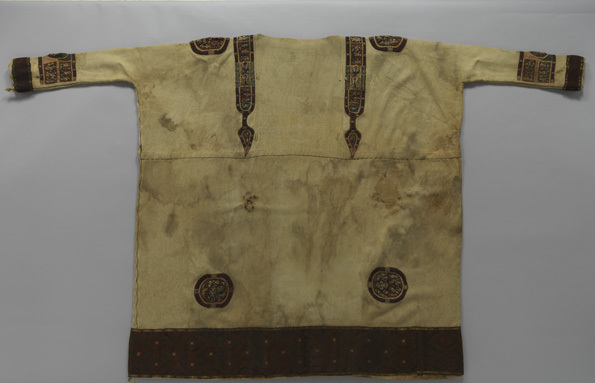 This tunic is a part of the permanent exhibit in the small Byzantine gallery in the Metropolitan Museum of Art. It is, as the title of this class details, directly beneath the Grand Staircase of the museum, and sort of nestled in its own special world of Coptic shinies. It is dated to 7th Century Egypt, and boasts a unique method of tailoring brought to the West via the Sassanian Persian Empire. This particular style of “fit and flare” tunic may have been what influenced later examples in Medieval Europe. The first thing I’m going to invite everyone to take a look at is the overall construction. It’s not too dissimilar from what we’ve come to know as a Birka tunic in the SCA, sans the underarm gussets that are commonplace in that design. There are side gores to widen the bottom for ease of movement, and the sleeves taper gently toward the wrist. The neckline is heavily influenced by Asiatic designs, and boasts keyhole design that fastens on the shoulder. The neckline and sleeves are finished with a blue and cream patterned silk tape, and the garment’s primary embellishments follow the traditional Roman-influenced patterns of the time. The roundels and clavii (vertical stripes) are woven from red colored wool, and appliqued onto the white linen tunic. Clavii (Singular: Clavus. Greek: Potamion/a.) The vertical stripes that are seen on late Roman/early Byzantine tunics. Originally denoting rank, but later becoming simply decorative. Coptic: The Copts were and still are native Christians to Egypt. Some believe it to be the Church of Mark the Evangelist. (Catholic is Peter, Orthodox is Paul.) We use the term “Coptic” to denote anything coming out of the Byzantine-occupied Egypt and parts of Ethiopian prior to the Fatimid Muslims taking over in the 8th Century. It’s really kind of a misnomer to use it for clothing, since a lot of the styles involved heavy influences of Hellenistic Greece, including pagan imagery. Roundel: A round applique or embroidered design on a garment. Sassanian Persia: The last Persian Empire prior to the spread of Islam by the Seljuk Turks. 224CE-651CE. Were a huge influence culturally on the Roman Empire. Check out that curved underarm! A term you’ll probably hear me use a lot during this class is “conspicuous consumption.” Nothing in this pattern shows attention to conserve fabric. The underarms are deliberately cut in an arc to make it more comfortable and reduce bunching, versus inserting a gusset. This provides a smoother fit but does not really conserve material, as the body needs to be cut to accommodate this. A teardrop shape is cut out of the rectangle to create the curvature of the underarm and slight flare at the bottom. The sleeve is attached around mid-upper arm, and it tapers toward the wrist. There is trim covering this joint, and some additional embellishment at the lower arm closer to the wrist. There is also a roundel on the shoulder between the clavus and this joint. I was thrilled to discover a Byzantine-period tunic with gores than really worrying about the size of them in question, as such things can be easily adjusted. This garment was tailored for somebody much smaller than the average person today. In fact, even my 5’2” size 0 jeans sister could not fit in this. But it’s not much of a secret that people 1500 years ago were smaller than we are today. I still like this though, because it shows that a wider flare for movement was still necessary, and it eliminated the bunching of the traditional rectangle tunic for wearing under layers. Unlike a solid gore that we see in some tunic patterns, this one is actually two small right triangles, individually sewn to the bottom already-flared skirt portion of the garment, and then connected via the side seam. The gores are set in lower on the hip, than rather on the waist. As previously mentioned, the embellishments on this are pretty standard for the Roman influence left in Egypt at the time. First we’ll take a look at the silk tape. Here’s another instance of conspicuous consumption, where the wearer is affluent enough to have a touch of Chinese silk on the hems and collar of their garment. Although silk is more comfy against the skin than wool, these are also the parts of the tunic that will see the most wear and tear. The maker of this probably knew that silk, although more expensive, was arguably more durable, but at the same time, more difficult to launder. The only think I really noted on this was how it was attached to the garment. 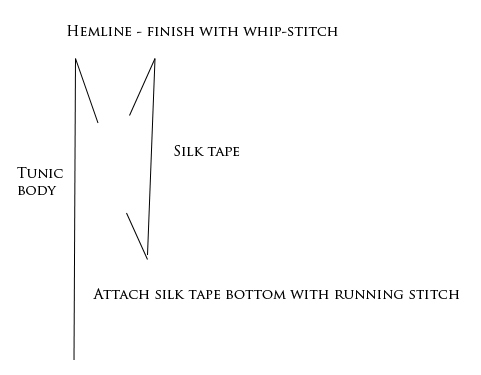 It is not a folded bias tape that goes over and protects the raw edge, but a trim added as a facing on the outside of the garment, The hem was created from whip-stitching the top of the tape to the raw garment edge, which was folded in toward the inside of the tape. 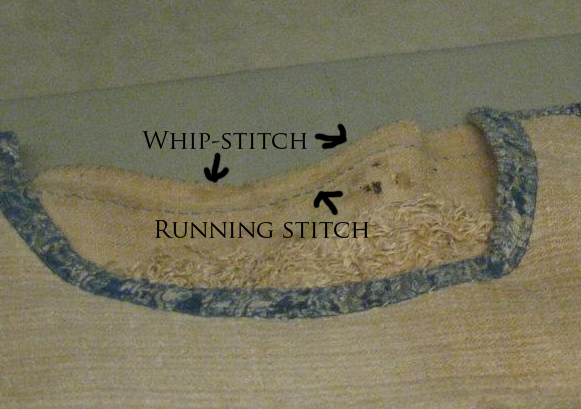 The bottom of the silk is attached with a running stitch. 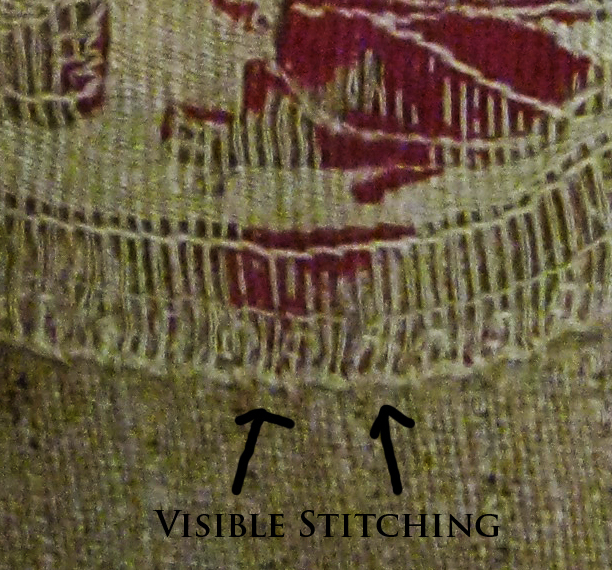 There are some visible larger whip-stitches in a white thread on the outside, but my guess is that this was a later repair work to keep the silk tacked down where the original stitches may have disintegrated. It does not run the entire neckline. The sleeve treatment is the same method. As far as the neckline closure goes, there is nothing remaining that suggests what type of fastener was used. It could have been a simple toggle and loop or a tie mechanism that was ripped off ages ago. 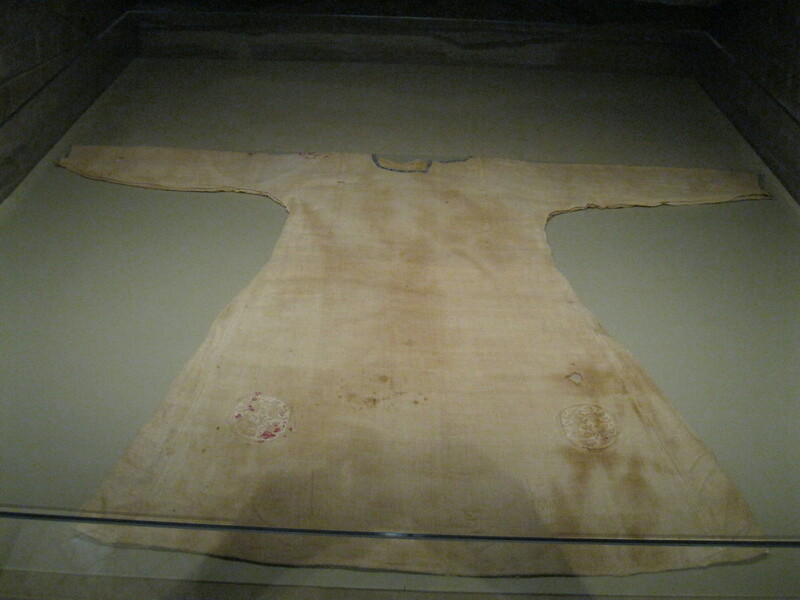 Some modern Orthodox Christian ecclesiastical garments do still have ties on the shoulder, but the Chinese-style toggle or button being in use is just as plausible, considering the Persian origin of the garment. Unlike the silk tape, the roundels and clavii appear to be tacked down using JUST a whip-stitch. 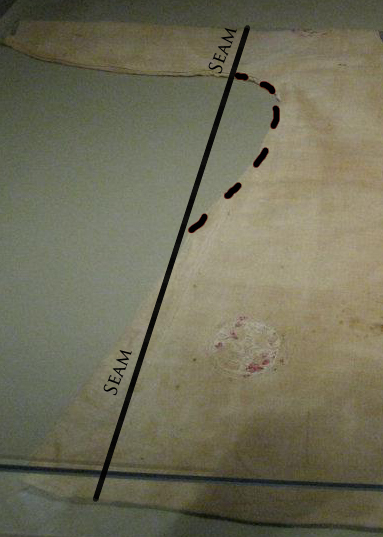 The seam treatments used on the overall construction of the garment appear to be a mystery. I saw no evidence of flat felling or thickness that would indicate a French seam. The conservators at the museum appeared to have pressed the seams flat, at least the ones joining the side gores, but that’s all I could really notice. There is a seam repair on the bottom of the right sleeve (photo left) that shows the same chunky whip-stitches present on the neckline, so my guess is that it is also later repair work. 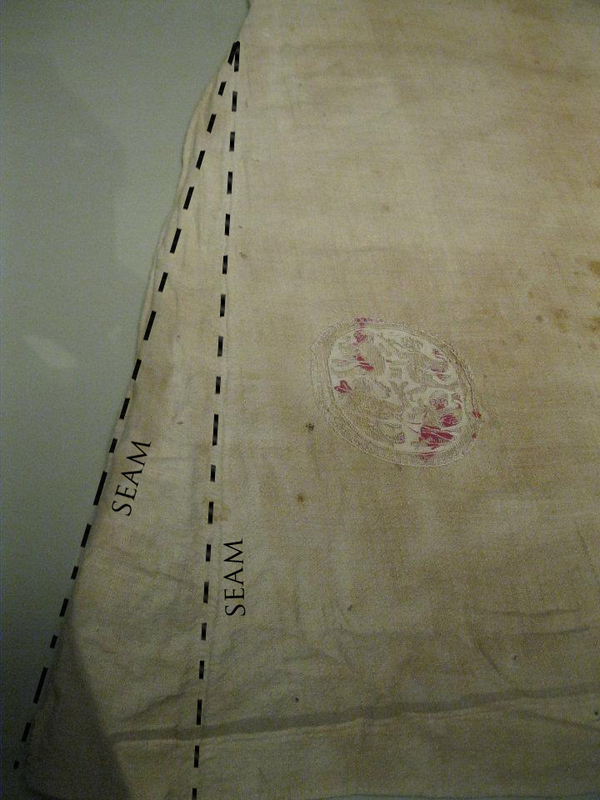 Seam finishes weren’t always used in period, so it’s okay to assume that it could be raw linen edges. I do not suggest leaving a modern interpretation this way, our fabrics are made differently, and mainly because a washing machine will rip it to shreds. So, what does this tunic mean? My overall interpretation is that this tunic is a transitional garment. It deviates enough from the blocky earlier Roman design into a more tailored fit. This would eventually make its way into the European continent and evolve into the “standard” for hundreds of years. Compare this other style tunic, contemporary to the one above. I definitely prefer a more tailored fit than wanting to deal with the bulk and folds that this rectangular cut would create. Tunic photo courtesy of the Metropolitan Museum of Art. I have drafted a simple pattern to use to make a tunic in this fashion that’s already posted here on the blog at https://annasrome.com/2014/01/03/byzantine-patterns-they-are-here/.